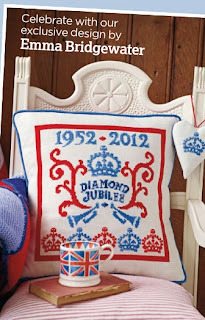 With the year begun, more diamond jubilee designs for stitchers to make are emerging. 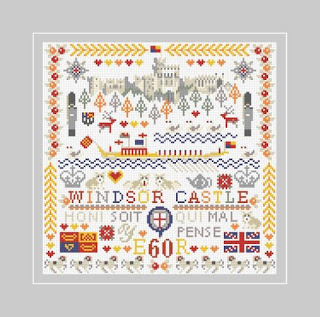 Riverdrift House has added Windsor Castle to its charming, bright range of jubilee samplers (Happy and Glorious and Buckingham Palace have featured in earlier entries on this blog. Sandringham and Balmoral to come). 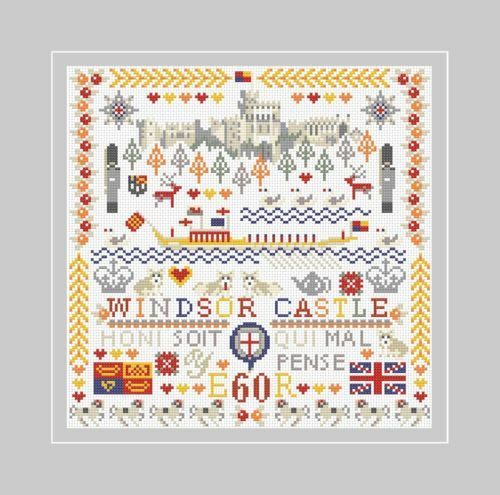 Brand new modern square sampler design for Windsor Castle, to celebrate our Queen's Diamond Jubilee in 2012 by Riverdrift House. Quick and fun to stitch, our design includes the castle flying the Royal Standard - with St George's Chapel, the Order of the Garter with motto 'Honi Soi Qui Mal Y Pense' and Garter Stars, a Royal gondola with the queen's swans upon the Thames, deer from the Great Park, arms of Eton College, a Union Jack, the Royal Standard, Castle Guards, crowns, 'all the Queen's horses' (Windsor Greys) ...and some Royal Corgis.. Being sold as a brand new kit and shown in a border to give the look when framed as a picture (or made up into a cushion). Best quality materials include white 14 count Zweigart Aida fabric, Anchor 6-stranded embroidery threads, clear chart, instructions and a gold-plated needle. Size of finished embroidery approx 25 cm / 10 inches square. Riverdrift House website is here, Riverdrift House on ebay.co.uk is here. British designer Emma Bridgewater whose designs have featured on crockery and textiles and Agas-with-dots has a design coming out in Cross Stitcher magazine. It will be in issue no 250, due to be published in the UK on 22nd February 2012. I rather like this one. It feels vintage and fresh. I read this magazine via Zinio as a digital magazine, so it will land on my device on that day in February. You can buy single issues or subscriptions via Zinio; or if you're not in the UK, wait a couple of months till it lands in the newsagencies. Tempest Tapestry, designs by Catherine Gedny, have a small and a large diamond jubilee tapestry cushion in their range. Both are available as kits or charts: the tapestry is not printed with the design, so it's like counted cross stitch to do (ie you have to concentrate rather than relax and colour in as you can with printed tapestries/needlepoint!). It's an interesting use of the Union Jack, with subtle diamonds/stars on it. I've seen that curlywurly font overused in school projects (it's a girls' fave) so I must say that for me, it's not one I especially like. I think my taste in patriotic samplers leans a bit more towards the classic, at least in font styles. But this may well hit the mark with younger stitchers. Diamond Jubilee. Wools include a shimmering silver yarn for working the highlights. This pattern is worked in half-cross stitch. This project is a delightful way to celebrate Her Majesty's Diamond Jubilee. Wools include a shimmering silver yarn for working the highlights. 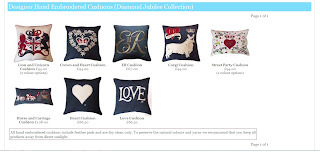 Find all Jan Constantine Diamond Jubilee items here. Cushions, found here. Prices range from £66.50 up to £108.00 . This is the next (and not the last, I suspect) of my blog entries about diamond jubilee designs. You can use the jubilee tag below to find the other entries. 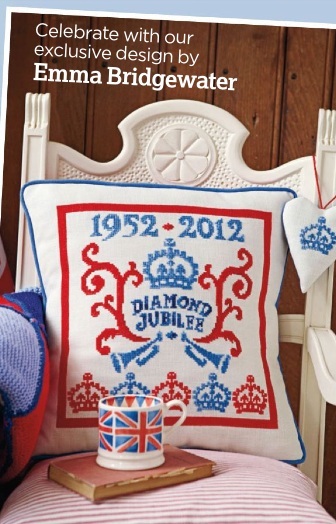 If you come across other diamond jubilee designs not yet blogged here, please let me know (eg. via the comments - just sign up to Blogger, it's free and I've had no hassles, and then you can comment). 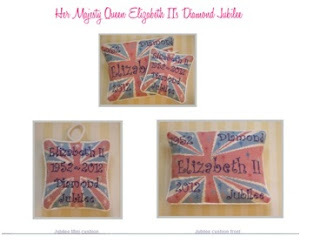 I am going to stop at the first two Riverderift House kits as I want a bit more variety in my Jubilee stitching. The Tempest Tapestry design by Catherine Gedney has jumped the queue and is next on my "to stitch" list as I love the colours. Then onto the Emma Bridgewater cushion. The already stitched cushions are a bit expensive and I prefer to do my own stitching. The Windsor Castle sampler from Riverdrift House is definitely my favourite of the set so far. I also quite like the Bridgewater ones! Just thought I would let you know that I really enjoy your blog and check it daily to see what new & interesting needlework you've turned up! If I every get my Queen's Beasts quilt for the Diamond Jubilee completed, I will forward you a photo! Thanks again for a great blog! Have you seen this "sampler" (1937 The Empire Celebrates)? It's one of the nicest I've seen in a long time. I love the animals!